About Firefly Ship Works Ltd. Here at the Firefly Ship Works (FFSW) our goal is to create reliable, flexible and affordable transport for you and yours, as you endeavor to reach vistas unseen and wilderness yet to be tamed. 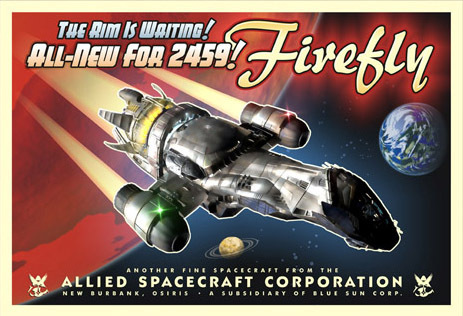 As such, we have put together this Cortex Wave Server (CWS) to keep you informed of our efforts to create the ‘Verse’s first and only screen-accurate Firefly Series 3, the Serenity Artisan Replica. The plan is this: Post updates on a regular (hopefully weekly) basis until Serenity is complete. Don’t assume just because we’re just starting this site now, we’re just starting development. We started research on this project two and half years ago and have been actively developing this replica for quite some time. The reason this site is going live now is we’ve finally sighted light at the end of tunnel and determined – to the best of our abilities – it’s not an oncoming GravLev train. If you’d like to have FFSW updates bounced directly to your Cortex router, just add this URL to your news reader: http://www.fireflyshipworks.com/?feed=rss2. Or you can just click on the shiny RSS icon at the top of your screen. But enough talk – let’s get started. The Rim is waiting!